Arthur is delighted to announce that his theory on the boxes was correct. They have now matured and are much more accommodating. He feels a bit like goldilocks in the house of the Three Bears, one of them will prove to be a perfect fit. This one, for instance, is looking quite promisingly Arthur-sized. 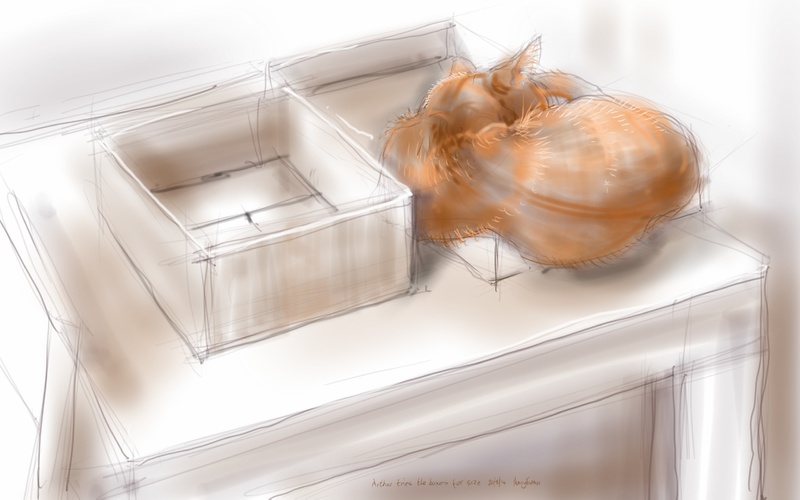 This entry was posted in Cats and tagged art, arthur cat, cardboard box, cat, cat drawing, cat in a box, cat-of-the-day, digital sketch, drawing, illustration on August 20, 2014 by Nancy Farmer.